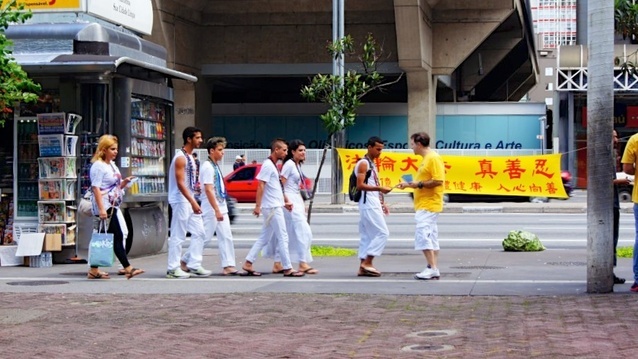 In time for Chinese New Year celebrations on January 31 and February 1, local practitioners gathered on the busiest street in Sao Paulo, Brazil, to raise awareness about Falun Gong and the ongoing persecution in China. Practitioners set up an informational display and handed out flyers to the passersby on Paulista Avenue, clarifying the facts about the Chinese communist regime's brutal persecution of the peaceful spiritual practice and sharing stories about the numerous health benefits that people have experienced by practising Falun Gong. They also demonstrated the five tranquil Falun Gong exercises and collected petition signatures calling for an end to the Chinese regime's forced organ harvesting from living Falun Gong practitioners in China. 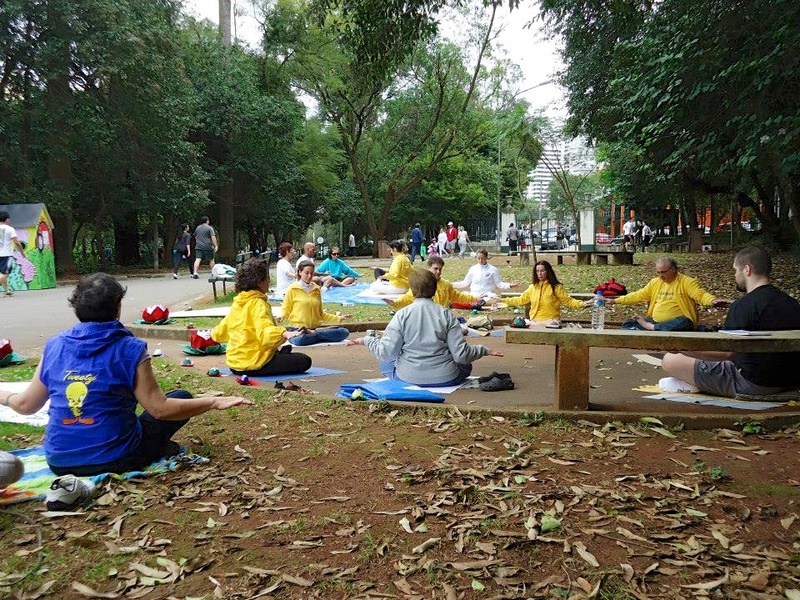 For the last two years, local practitioners have held various activities in São Paulo once a month to introduce the practice of Falun Gong and raise awareness about the senseless persecution that has been taking place in China for the past 14 years. They have handed out flyers, displayed banners and informational posters, demonstrated the exercises, and collected signatures on petitions to end the persecution and stop the forced organ harvesting in China. They have also held free workshops to teach people how to make origami lotus flowers. Practitioners regularly meet in local parks to practice the exercises and study the Falun Gong teachings together. 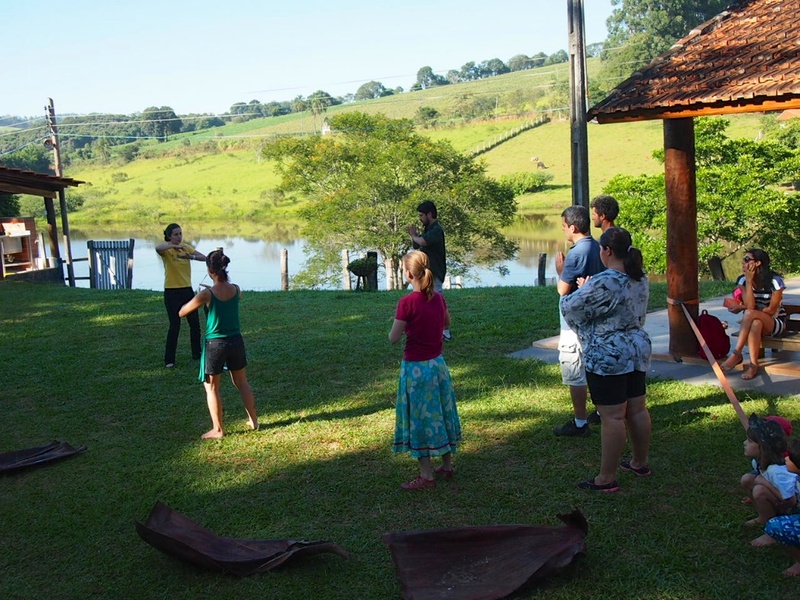 Over the 2014 Chinese New Year weekend, they gathered in Parque da Juvenude, a cultural center and park in the city of Sao Paulo, where many people expressed interest in learning the exercises. This weekend, practitioners also visited the Burgh of Liberty, which is home to many Chinese, Japanese, Korean, and Taiwanese immigrants. They handed out flyers to increase people's awareness about the persecution in China. Several Falun Gong practitioners from Europe came to Sao Paulo during the winter holidays to support the local effort to help more Chinese people quit the Chinese Communist Party (CCP) and its affiliated organizations. More than 155 million Chinese people have withdrawn from the CCP and its affiliated youth leagues to date, thereby separating themselves from the human rights atrocities committed by the regime. The local and European practitioners held activities in the Chinese commercial center of Sao Paulo to help people renounce their CCP membership. They talked about Falun Gong and the persecution and explained the significance of withdrawing from the Party. Many people understood right away and gladly quit the CCP. Some, however, needed a little more convincing. Brainwashed by the regime's propaganda to believe that there could be no China without the Party, they hesitated to renounce their CCP membership. The practitioners explained to them how the CCP has persecuted millions of innocent people and has brought a lot of harm to China. They reiterated that China has a rich history of 5,000 years, but that the CCP has been around for only about 60 years, so the Party is only a form of government not China itself.